Harwich is the most northerly seaside town in Essex and is most well known as a shipping port. The town got its name from the Old English word 'Here-wic', which means 'military settlement' and the Royal Navy established a dockyard here in 1652. The military are no longer here, but you can still see reminders of the town's military past, most notably the Harwich Redoubt, a circular fort built in 1808-10 to defend the port from the Napoleonic invasion. It is now surrounded by houses, but would have once stood proud, alone atop the hill, visible for miles around as an intimidating deterrent to potential invaders. You can visit the fort and go inside for a small fee (£3). 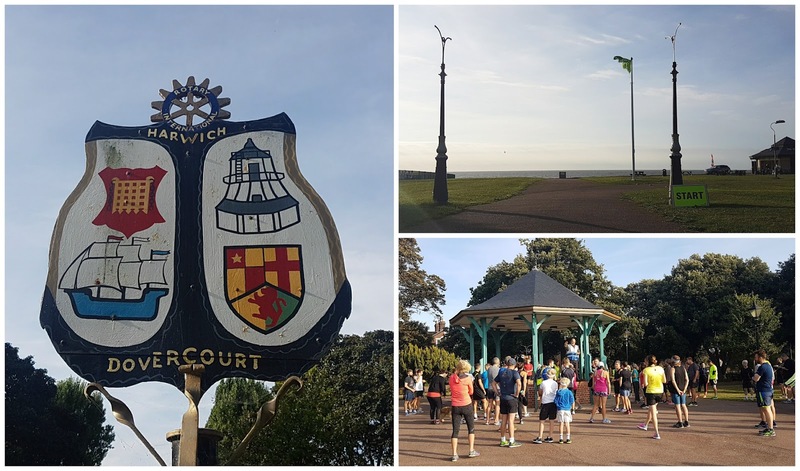 We travelled over to the far side of Essex to visit Harwich parkrun, which actually takes place in the seaside town of Dovercourt, Harwich's older and larger but less well-known neighbour. They used to be two completely separate towns, but are now contiguous. Dovercourt was an extremely popular seaside town back in Victorian times and owes a lot of its popularity to a merchant called John Bagshaw. Despite his eventual bankruptcy he was responsible for commissioning some of the town's best known buildings and was an active part in bringing the railway to Harwich/Dovercourt, which of course was key to its popularity. One of the buildings he built was a mansion called Cliff House (1845), where he lived. However after his death in 1861 the house remained empty for many years until being demolished in 1909. Two years later the grounds of the house had been remodelled into 'Cliff Park' and this is where Harwich parkrun is based. 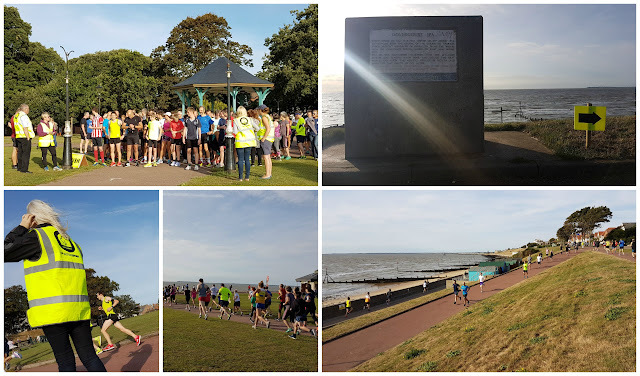 The parkrun had it's inaugural event on 1 August 2015 and attracts around 100 participants each week (official average at time of my visit was 78.9). We drove to the venue and parked on Barrack Road which is just next to the park. There are other nearby side streets that allow parking, but if there are no available spaces then the Milton Road Car Park (68 spaces) is the next best option. From what I can see the fees are 80p for an hour, £1.40 for two and £3 for up to four hours which should be enough to cover a parkrun visit. Had we taken the train we would have alighted at Dovercourt Bay station which is approx 5 minutes from the park. Cyclists can tether their steeds to the cycle racks which are located next to the children's playground in the park. There are toilets in the park and these are located in the 'Dovercourt Cliff Park Cafe' building which is also used as the post-run tea/coffee social venue after the run. The toilets have seasonal opening times however this doesn't affect the mornings which are set at 8am all year round. The parkrun HQ is set up in and around the bandstand which you cannot miss as the park is actually pretty small. The run briefing took place a few minutes before 9am and on the hour the runners were sent off to complete their regular Saturday morning 5k. The run starts right next to the bandstand and features 1.5 meandering clockwise laps of the tarmac path around the park where the keen-eyed runners will see a stone which marks the location of the former Spa, which was built when a Chalybeate Spring was discovered. 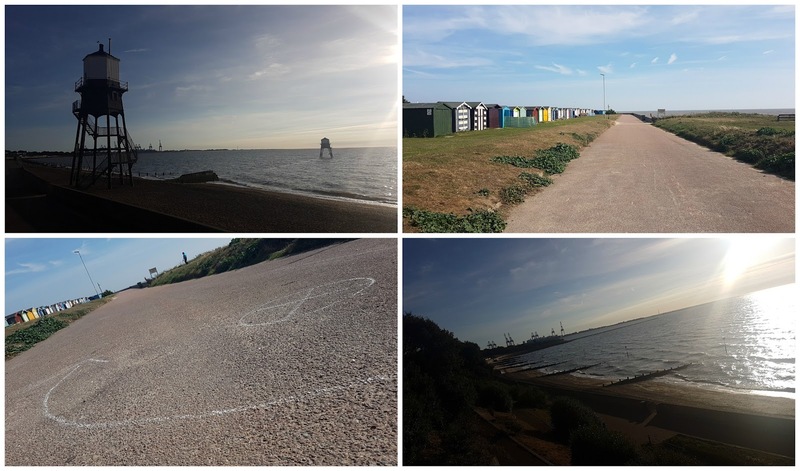 The runners then zig-zag down a ramp and onto the seafront promenade for a single out-and-back along Dovercourt Bay. Underfoot is 100% tarmac/concrete so road shoes are perfect for this course (I wore my New Balance Zante V2's) and with the exception of the ramp and a small bump on the seafront, it is flat. 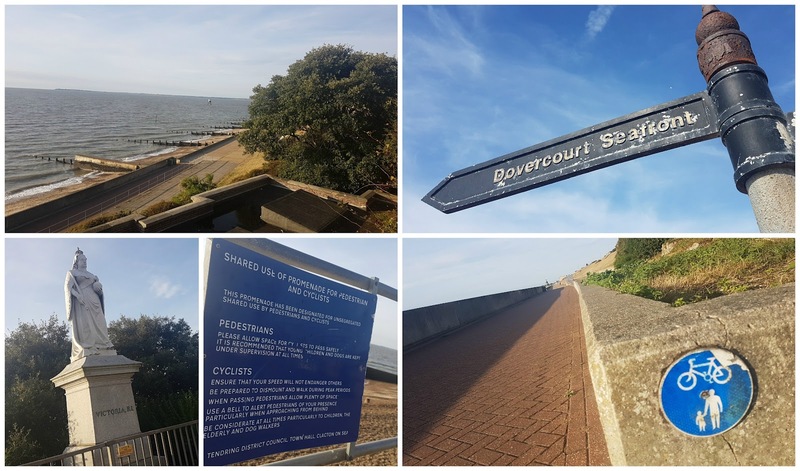 A large chunk of the promenade is a shared-use space for people and cyclists so it's important to stay aware of what's happening around you. The organisers also ask that runners keep to the left at all times. After a few minutes on the promenade the runners pass a statue of Queen Victoria, however they probably won't see it as it is on the upper level - it is known as being Dovercourt's most famous landmark, is 14ft. high and weighs 9 tons. It was erected in 1904, three years after her death and stands as a memorial. If you look way into the distance to the south you can see all the way across to Walton-on-the-Naze. The next notable landmarks are the two historic Dovercourt Lighthouses (aka The Dovercourt Range Lights); one was a high light and the other a low light which, when aligned could be used to guide ships into the harbour. They were in use between 1863 and 1917. At around this point the 'award beach' begins; this has been awarded a blue flag certification which means that it has met some pretty stringent standards around water quality, safety, environmental education and information etc. 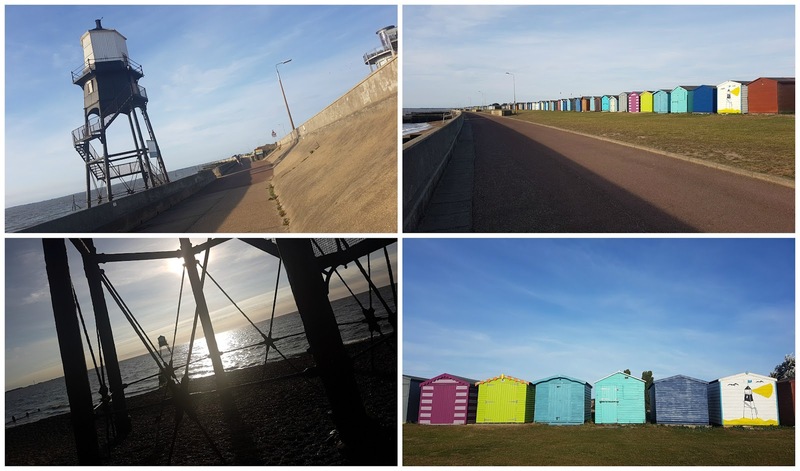 There are also many colourful beach huts to admire in this section and if you wanted to own one you'd be looking at stumping up somewhere in the region of £5000 - £8000. One of them 'My Happy Hut' won an award for the best beach hut of the year 2016. The promenade soon swings to the right and at the end is a gate and a turnaround point. When I visited the point was marked in chalk with an arrow. Plus it also had a cone as a physical marker to run around. It's worth noting that if any runners were desperate for the toilet there is one right next to the turnaround point. Once around the cone the runners head back (still keeping left) all the way back along the promenade. Looking into the distance to the north the cranes that line Harwich port can clearly be seen and are quite a sight. Eventually the runners reach the slope that they came down about 4.8 kilometres earlier. They head back up and into the park where they re-join the path they ran around at the beginning and follow it back around (still running clockwise) until they reach the bandstand, and more importantly, the finish line. 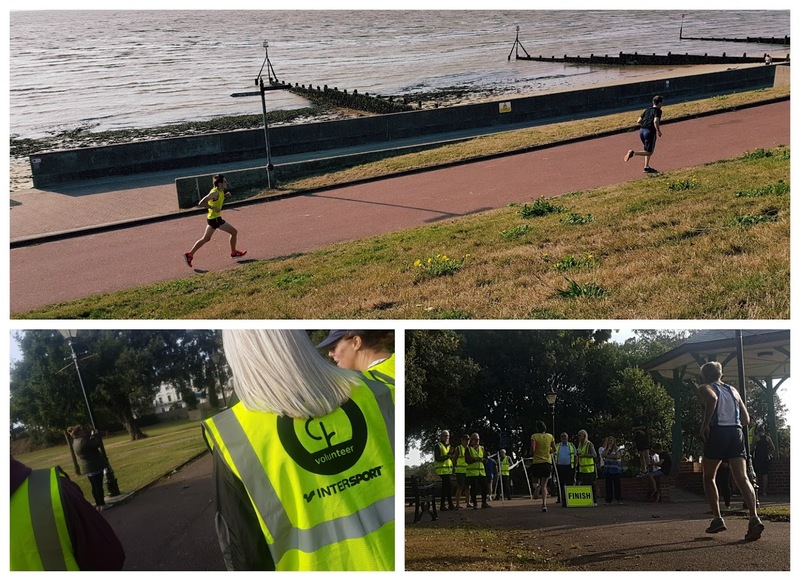 When I visited there were extra volunteers on-hand at the finish as the team from the forthcoming (15 Oct 2016) Clacton Seafront parkrun were receiving some training. Barcode scanning took place in the bandstand and the results for event 63 were available a few hours later. While I ran, my wife and daughter had been hanging out in the playground which was fairly decent. They were particularly impressed by the swings which face the sea and the pirate ship complete with treasure, seagulls and a mermaid figurehead on the bow. 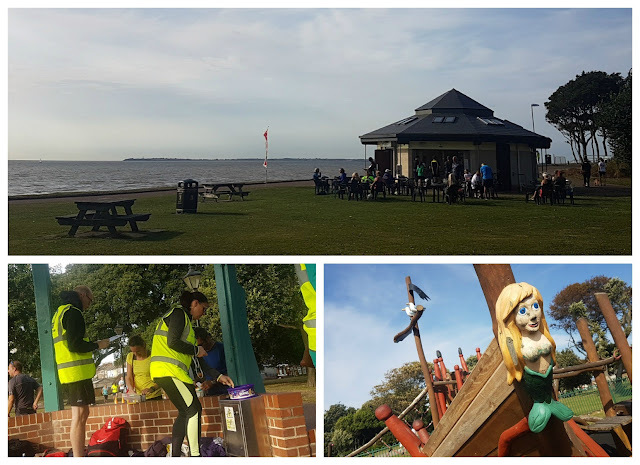 As it was quite a windy day we decided to skip the alfresco post-run social and headed into the centre of Dovercourt where we found a nice little place that served breakfast instead.